Guess what? Your SMS marketing list is only as strong as your promotional efforts. If you’re not engaging customers with opt in incentives and promotional materials, the list simply won’t grow. And, it obviously goes without saying, no list means no business growth. 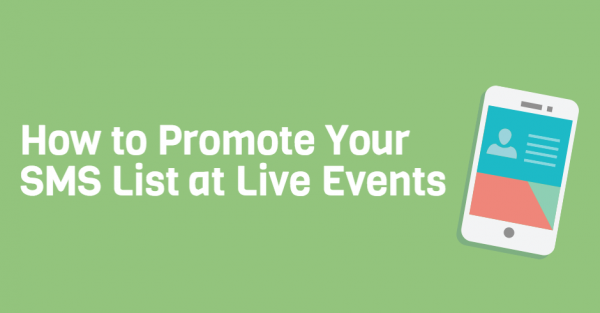 So, with that said, here are a few promotional strategies for those of you who regularly host live events. These strategies would ideally be implemented at sporting events, live concerts, large church gatherings, and so on. Flash SMS marketing opt in details on a jumbotron or large TV screen. But, don’t waste your moment in the spotlight. Make best use of these promotional tools by featuring an irresistible incentive. Ideally, you should use this outlet to highlight a text to win contest. Have the keynote speaker verbally engage the audience. There’s still strength in verbal engagement. Have your keynote speaker, host, pastor, etc. quickly mention SMS marketing list details. When discussing your opt in inventive, keep it simple and right to the point. Don’t confuse your audience with a long, drawn out explanation. As SMS marketing is still a fairly new tactic, verbal engagement helps increase trust and dispel any untrue myths. List opt in details on programs, brochures, and event flyers. Are audience members walking away with goodie bags? Stuff the bags with SMS marketing list details. Or, let’s say you’re hosting a concert, and each attendee gets a program. Dedicate one page to a mobile reward program call to action. Partner up with the top SMS marketing provider, Slicktext.com. Give us a call today at 1.800.688.6290 to learn more, or hop over to our pricing page and sign up for a free plan. We offer a feature rich platform, coupled with dense educational tools that empower you, the SMS marketing user, to succeed.